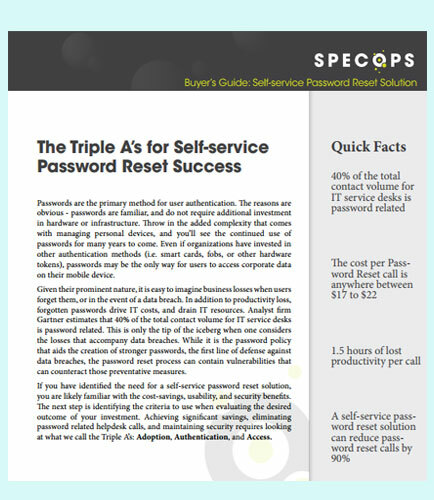 "White paper on Self-service password reset and management solution"
If you have identified the need for a self-service password reset solution, you are likely familiar with the cost-savings, usability, and security benefits. The next step is identifying the criteria to use when evaluating the desired outcome of your investment. A self-service password reset and management solution not only reduces the number of help desk password tickets but also enhances the productivity of an end user by averting unnecessary and prolonged waits. This whitepaper provides insights for achieving significant savings and maintaining security requires looking at what we call the Triple A’s: Adoption, Authentication, and Access. • Cost effective - uses existing assets such as Active Directory, mobile devices, and authentication devices.